Kenya says Nairobi attack over, all five gunmen killed - SABC News - Breaking news, special reports, world, business, sport coverage of all South African current events. Africa's news leader. Fourteen people lost their lives after militants stormed an upscale Nairobi hotel. Kenyan President Uhuru Kenyatta said Wednesday that gunmen who stormed a luxury hotel complex, killing 14 people, had been “eliminated” after an almost 20-hour operation in which hundreds of civilians were rescued. The attack was claimed by the Al-Qaeda-linked Somali group Al-Shabaab, which has targeted Kenya since it sent its army into Somalia in October 2011 to fight the jihadist group. At least one suicide bomber blew himself up and others swapped gunfire with security forces as the assault on DusitD2, a complex which includes a 101-room hotel, spa, restaurant and offices, unfolded on Tuesday. 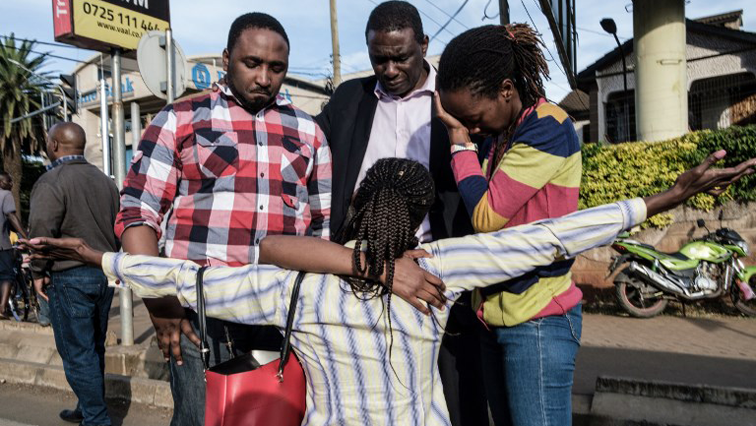 For many Kenyans, news of the attack revived traumatic memories of a 2013 Shabaab raid on Nairobi’s Westgate shopping mall that left 67 dead — a siege played out over four days that led to sharp criticism of the authorities’ response. But this time, local media heaped praise on the security forces for their intervention, which Kenyatta said entailed the evacuation of some 700 civilians. George Kinoti, the director of criminal investigations, told AFP that “two principal suspects” had been arrested in connection with the attack. He said one was arrested in the suburb of Eastleigh, and the other in Ruaka, northwest of Nairobi, where officers carried out a raid on a house where one of the attackers lived. “One of the men was identified by locals, who called police and they have confirmed that he lived there with his wife,” a police source said on condition of anonymity. CCTV footage broadcast on local media showed four black-clad, heavily-armed men entering the complex on Tuesday afternoon. A police source said two attackers were shot dead Wednesday morning after a prolonged shootout. The attack began at about 3pm (1200 GMT) on Tuesday, with a loud blast followed by gunfire and rapid calls for help spreading on Twitter. Boinnet earlier said the attack began with an explosion targeting three cars in the parking lot and a suicide bombing in the hotel foyer. The British foreign office confirmed the death of a British-South African dual national and said another British person was injured. A mortuary official said there were also 11 Kenyan victims, one with no papers, as well as an unidentified torso of a male adult. It was a tormented night for families of those trapped as they waited outside the hotel while sporadic gunfire rang out. After dawn, explosions and shooting intensified until the complex was secured mid-morning. In downtown Nairobi, dozens of people lined up at a memorial for the US Embassy destroyed during an Al-Qaeda attack in 1998 to give blood. This entry was posted on 16 Jan 2019,04:25PM at 4:25 PM and is filed under Africa, News, Homepage Latest Stories Slider. You can follow any responses to this entry through the RSS 2.0 feed. Both comments and pings are currently closed.